Make your best case – and leave the tech to us. Nothing kills the impact of your painstakingly crafted case like a sudden break in your flow. That’s why our clients recognize the value of bringing in an expert to handle the technical side of their courtroom presentations. A great technician maintains your timing, acts as a safeguard against technical problems, and can adapt to new or unforeseen circumstances without missing a beat. 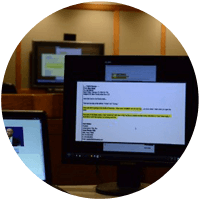 At Litigation Insights, our consultants have no fewer than 12 years’ experience in the application of industry-leading presentation software and equipment, as well as an advanced knowledge of courtroom protocol and procedure. We employ a redundant setup that allows for instant switching to a back-up system should a computer failure or software glitch occur. We make a point of learning the case facts, becoming familiar with your exhibits, and knowing how those exhibits support your case, and we work closely with your attorneys to provide continuity and peace of mind. Ensure seamless and reliable presentation support throughout trial.